White pine trees were growing here when Columbus made his voyage to America. 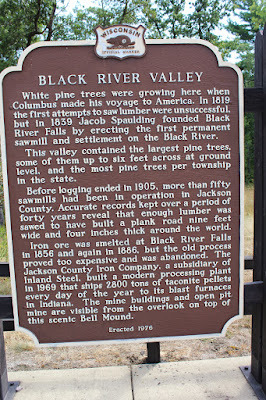 In 1819 the first attempts to saw lumber were unsuccessful, but in 1839 Jacob Spaulding founded Black River Falls by erecting the first permanent sawmill and settlement on the Black River. 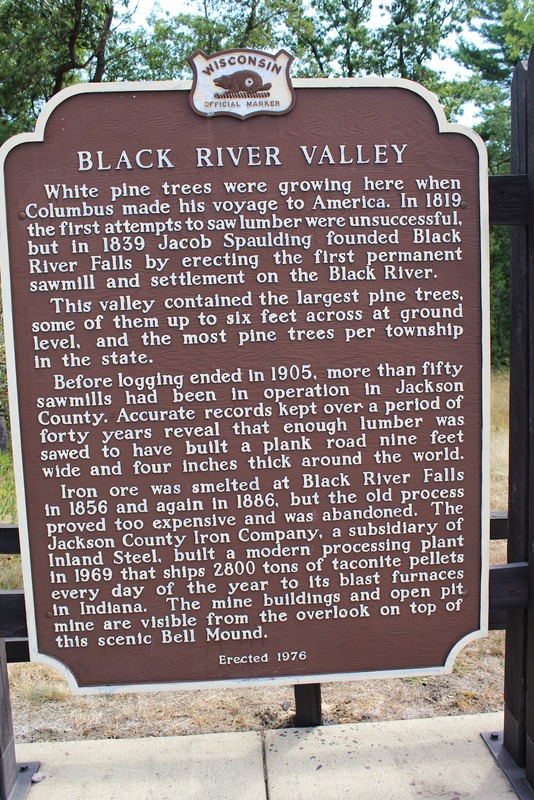 Before logging ended in 1905, more than fifty sawmills had been in operation in Jackson County. Accurate records kept over a period for forty years reveal that enough lumber was sawed to have built a plank road nine feet wide and four inches thick around the world. Iron ore was smelted at Black River Falls in 1856 and again in 1886, but the old process proved too expensive and was abandoned. The Jackson County Iron Company, a subsidiary of Inland Steel, built a modern processing plant in 1969 that ships 2800 tons of taconite pellets every day of the year to its blast furnaces in Indiana. The mine buildings and open pit mine are visi­ble from the overlook on top of this scenic Bell Mound. Marker is at Rest Area 54 on westbound Interstate 94, W8600 Interstate 94, Black River Falls, Wisconsin 54615.